This year marks the 24th Anniversary of the McCollom-McFarlane award which began in 1994. It was established in honor of two past MMI board members, to honor a person served from each primary location of MMI. Nominations are gathered then based on a vote of the persons receiving services the McCollom-McFarlane overall winner is selected. 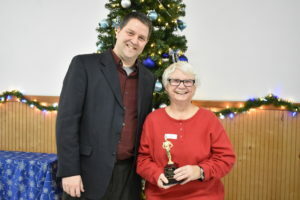 These awards are given out at the annual Board meeting in December. Emily began services with MMI in January 2015, participating in Community Connections 1-1 (CC 1-1) services. In 2017 Emily began Employment training services where she gained work skills, this service was funded through Michigan Rehabilitation Services (MRS). Emily completed her OJE at Graphic Design while working at Masonic Home through a school-to-work program. During her evaluation Emily gained a variety of employment skills and knowledge. Emily who graduated from school in spring of 2018 is now focused on the next phase of her adult life. Emily is a very social person. She has a pleasant personality and infectious smile that brightens any room that she walks into. Emily is fortunate to have a supportive mother and many supportive siblings. Emily works well with structure and is determined to complete all task presented to her. Emily enjoys participating in a variety of activities, such as Special Olympics, family camping trips, basketball, soccer, and softball. Emily provides a variety of supports to her family, which include babysitting, cooking family meals once a month for her and her 10 siblings. Emily also helps with her family’s Mud Bogging business, where she serves meals for veterans. During Emily’s time in CC 1-1 services, she was given several tasks to complete, such as improving her Adult Living skills. Emily worked on safety skills, money skills, socialization and meal prep. With the assistance of her coach LaMeil, Emily was able to start an “all-age, all-inclusive” social group, which she named “Helping Our Village” (HOV). In June 2018 Emily formed the mission to help others 1 meal at a time. Emily partnered up with the Isabella Soup Kitchen, she found businesses to sponsor her mission, she took in donations and performed odd jobs in order to make these community dinners a success. The Isabella Soup kitchen provided the venue. With the help of her sponsors, donations, and a variety of odd jobs, Emily was able to raise enough money to purchase items needed for the meals. Emily hosted a meal at the Soup Kitchen on the last Wednesday of the month for the months of July, August and September. Emily, her CC staff and a group of volunteers cooked and served hot meals to approximately 150 community members. But Emily did not stop there; HOV also provided the community with donations of free haircuts, household gift baskets, gift cards, free oil changes, backpacks, and school supplies. Emily is making great strides as she is presented with new goals as she starts this next phase of her life. Emily has made it her priority to gain employment, promote her personal safety, maintain healthy relationships with others and has been diligently working on increasing her knowledge with navigating the bus system and knowing her surroundings in her community. This is important to Emily, so she can independently get to work and protect her personal safety. Emily continues to work hard to “live her best independent life” while discovering her purpose. MJ accessed services at MMI on September 9, 2014. He is currently participating in MMI’s Employment Connections, Community Employment, and Community Connections programs. MJ is extremely polite, easy to get along with, always strives for more independence through new opportunities offered to him and is and enthusiastic when it comes to his training. MJ’s positive attitude, flexibility with changes which supports his increasing independence, and his increasing abilities are the reasons he was selected for this award. MJ graduated from Pewaukee Public High School in Pewaukee, Wisconsin, with his diploma in June of 2014. When his family moved to Michigan, MJ was referred to MMI for employment training and has been making progressive strides ever since. He currently participates in MMI’s training program three days a week in Employment Connections and Community Connections activities. Part of MJ’s journey was as part of the Clare MMI janitorial Crew. As part of MMI’s Supported Employment program, this crew was a closely supervised janitorial crew that cleaned MMI’s Clare location after the program day ended. When he first started working on this crew, MJ was apprehensive about going into the Clare Director’s office to empty her trash or to vacuum. Finally, he disclosed the reason why he avoided her office. MJ explained that there was too much MSU stuff in there! (MJ is a huge U of M fan.) After a conversation with his employment coach, MJ became more willing to go into that office and eventually was able to do so without thinking about all the green and white gear. With some consolidation this crew’s duties became part of the Clare evening crew. MJ expressed interest in working on that crew, which requires people to take on more independent duties, including riding on public transportation independently. When a spot opened on this crew, the offer was made to MJ and he took it. For the past few months he has been a regular member of the Tuesday night crew. His employment coach reports that he can be a hard worker who gets along well with the rest of the crew members. This has been a positive step for MJ in his training here at MMI. One of the challenges MJ faces daily is speaking with others. He often struggles with getting his words out, which can be frustrating for him, but he doesn’t let this stop him. Over the last year MJ has made great progress talking to his coworkers and staff, including initiating conversations with his employment coach. His love of sports often sparks conversation with staff about how his favorite teams are doing and when they play next. MJ has a very active life outside of MMI as well. Many summer weekends are spent camping with his family, and last winter he was able to attend a Detroit Tigers spring training game while on vacation in Florida. He is also very involved with Special Olympics, playing bocce ball, soccer, and basketball each year. MJ is a team player, both for Special O and for work. Other than for family activities and Special Olympics, MJ rarely misses a day at MMI. He arrives every day he is scheduled ready to do whatever the day brings his way. Staff know they can direct him to help with whatever they need, and he often will do so with a smile. During the time that MJ has been at MMI it has been a pleasure for us to support his personal growth. Jason started with Mid-Michigan Industries youth services in June of 2007, more than 10 years ago. Where he learned to be ready for the real world in a variety of ways; socialization, developing appropriate relationships, taking care of himself, and work ethics. Jason has always worked hard at the tasks presented to him and achieved them not only to our expectations but the expectations that he holds for himself; which might be a little higher than ours. Jason enjoys participating in a variety of activities. He likes to ride his bike to Stanton on nice days to see his friends and to help others within the community by volunteering at Habitat for Humanity. He likes participating at special Olympics. Jason has a gift when it comes to art and has had his own art displayed at shows around the area. Jason, after working as part of our MMI job crews in Montcalm County, decided that it was time for him to get a job independently. He now works at Arby’s of Greenville, where he is able to maintain his job with natural supports. He is responsible for cleaning, greeting the customers, stocking, and making sure the floor is kept up to corporate expectations. Jason now helps to train some new staff who have been hired after him. Jason has come a long way since the very beginning of him starting his journey with Mid-Michigan Industries. He has made his parents very proud, the staff at Southern Operations very proud, and takes pride in himself for the things that he has accomplished. MMI’s Board of Directors established awards to recognize the people who receive services at MMI. The Case Management Services and McCollom-McFarlane Achievement Awards recognize the accomplishments of individuals participating in MMI’s programs. These awards are given out at the annual Board meeting in December. Gretchen was the young mother of a toddler when she entered the PATH program in February of 2017. In an effort to obtain employment that would enable her to support her family, Gretchen enrolled in a Medical Assistant program through Ross Medical Learning Center in Saginaw. However, she soon realized that going to school full-time, working, and raising a young child by herself was an overwhelming load. Furthermore, her schooling overlapped her work hours to the point that she was not able to work enough to pay her bills. In desperation, she applied to DHHS and started the PATH program. With the assistance of DHHS, and supportive services through the PATH program, Gretchen was able to focus on her education while still spending quality time with her child. Gretchen learned from this that sometimes it is okay to reach out for help, and that doing so can actually be a very positive experience. When Gretchen’s training was complete, Michigan Works! helped her find suitable job listings. Her Career Coach gave her instruction and assistance in preparing herself for job interviews. This year marks the 23rd Anniversary of the McCollom-McFarlane award which began in 1994. It was established in honor of two past MMI board members, to honor a person served from each primary location of MMI. Nominations are gathered then based on a vote of the persons receiving services the McCollom-McFarlane overall winner is selected. These awards are given out at the annual Board meeting in December. Donna started with MMI back in 1985, more than thirty years ago. She began at MMI like so many did at that time, working in production but she soon progressed to working in Community Employment. Donna has worked on a wide variety of Community Employment Crews. She has worked on day crews doing recycling and grounds maintenance, and evening crews doing nearly every janitorial crew that MMI has had over the past 32 years. Donna is a very social person. She has a pleasant personality and a good sense of humor which helps her maintain relationships with a variety of people. Donna is fortunate to have a supportive family. She cooperates well with others, is a good worker and is willing and able to show others how to do a variety of tasks. Donna enjoys participating in a variety of activities. She likes to be helpful to others in her family and in the community. She likes camping, participating in Special Olympics, volunteering to assist with events through Special Olympics, softball, bowling and attends Mt. Pleasant Community Church regularly. She also helps with Sunday school as well as vacation bible school in the summer. Donna is very thoughtful of others that are going through a rough time. She is always thinking of them and will say a prayer for them. You might think that is enough for one person, but not Donna, who also has a micro-enterprise that Listening Ear assists her with. In her spare time, Donna makes greeting cards, personalized tags, calendars, and soaps. Donna sells all of her products at crafts shows and special events such as the Dickens Christmas event in downtown Mt Pleasant early in December. Donna, after working with MMI for around 15 years, decided to get an independent job. Soon after beginning this endeavor she was able to start working at the Soaring Eagle Casino as part of their cleaning crew. When that didn’t work out the way she planned, she chose to come back to MMI, for more training with the CE crews. Corey began working at MMI on August 6th 2012. He is currently enrolled in MMI’s Employment Connections and Community Connection programs. Corey is an eager and determined individual who takes great pride in his work. He strives to complete assigned tasks as independently as possible. Corey’s work ethic, willingness to accept and embrace change, and his leadership skills are the reasons he was selected for this award. 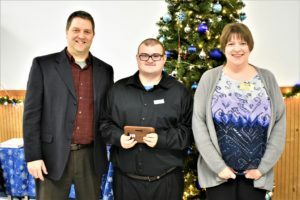 Corey completed his education this past June with the Clare- Gladwin RESD, and since has shown great progress in expanding his employment opportunities. Corey attends MMI five days per week, working in the manufacturing area for half the day and participating in Community Connections the other half. He has experienced a wide range of work over the past year, and when an opportunity arises for him to work, he readily volunteers. Corey also receives training with MMI’s janitorial crew that is responsible for cleaning the Clare office. 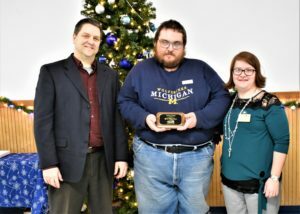 He has been referred to Michigan Rehabilitation Services for community integrated employment and recently finished his first on the job evaluation successfully. Corey has worked hard to gain personal independence and embraces the changes that he faces daily. He has recently moved into an independent living environment. Corey enjoys staying busy. When he is not working, he enjoys working on re-building motors and works on mechanical projects with his roommate. Corey is someone that is viewed as a leader by his peers. He steps up and is a willing volunteer to help whenever he can. Corey is a polite and considerate individual, always looking for ways to help others around him. According to the Coaches he works with, Corey is an enthusiastic worker and helper who will try anything at least once! During the time that Corey has been at MMI it has been a pleasure for us watches Corey’s personal growth. His ambition and positive attitude towards change are contagious! Paul began in services in 2015. He was nominated for this award because of the overall quality of the efforts that he has made to enhance his life. Paul’s services began with Community Living Supports in 2015. During that time he was apprehensive about services with MMI. While he always remained polite and courteous Paul’s lack of interest in having a tidy home was apparent. Through consistent coaching and encouragement gradually Paul became more invested in the services he was receiving from MMI and was able to make significant advancements towards achieving his goals. Recently, Paul was off work recovering from an injury. During this time he kept in contact with his coaches’ to make sure they knew how he was doing. When he was ready, Paul made sure to notify MMI that he was ready to “get back to work”! With all the efforts that Paul has made and his accomplishments it is obvious why Paul was selected for this award. Paul’s participation has improved greatly, he is much better at keeping his apartment clean, and he no longer complains about the tasks that his staff ask him to do. Paul is looked upon highly by his co-workers and his coach.